The GSM Association released an interesting in-depth report – The Mobile Economy India 2013 – which talks about various mobile trends prevailing in India. The stats and numbers presented in the report make for an interesting read. The report states that in mobile ecosystem in India contributed about 1.27 Lakh crore or 1.3 percent to India’s GDP in 2012. Given the growth of telecom subscribers in India, I am quite surprised that it’s contribution is so low. According to GSMA report, by end of this year, 107 million subscribers will have 3G connections out of total 9191 million mobile connections. The 3G number will grow to 171 million by end of 2014 and will reach 409 million by 2017. As expected, the non-voice revenues are significantly growing, while the revenues from voice have slowed down significantly. 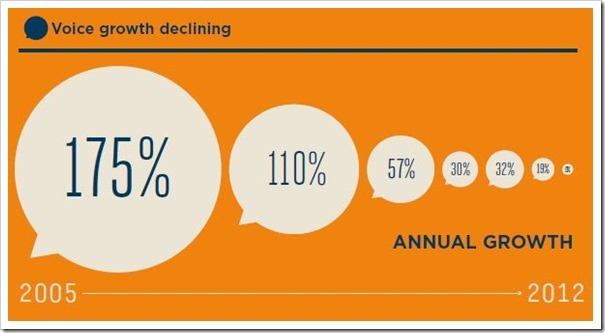 In 2012, voice traffic saw only 9 percent growth as compared to 19 percent growth in 2011 and 32 percent growth in 2010. Non-voice (VAS) revenues on the other hand are seeing upwards 50 percent growth. India has one of the lowest mobile call rates in the world. When the tariff wars were at peak in 2011, the voice call rates touched the lowest of only INR 0.355 per minute. While it increased to INR 0.400 in 2012, it is still lower than what was prevailing in 2010 or earlier. 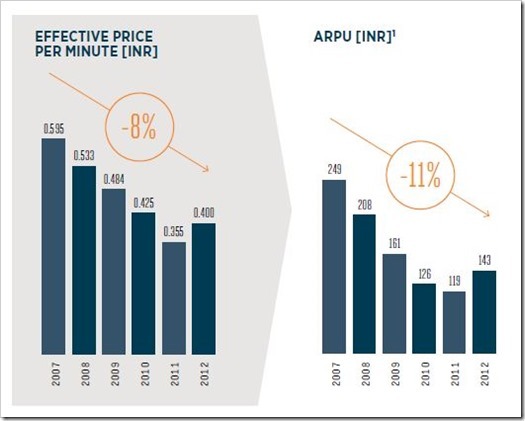 With low call rates, the average revenue per user (ARPU) also saw a significant dip in 2011 of only INR 119, but increased to 143 in 2012, presumably due to growth in VAS service offerings. The report gives an interesting statistic, and I am not sure how they arrived at it. But it says, that in 2012 the economic impact from mobile technology in India amounted to Rs 5.3 lakh crore (US $100 billion) or about 5.3 percent of GDP. The report calculates the total impact of mobile ecosystem based on productive increase of people among other things which itself contributed to about 3.8 percent. The mobile ecosystem contributes nearly 2.730 million jobs in India out of which 730,000 jobs are direct, while 2 million jobs created at point of sale and distributor/vendor chain. 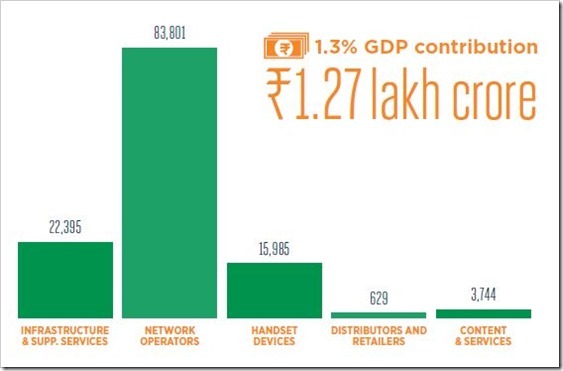 The report also talks about strong correlation between mobile ecosystem growth and GDP. – Doubling of mobile data usage increased GDP per capita by 0.5 percent. The report also talks about how mobile ecosystem is positively affecting Social Agricultural, financial and other verticals in India. You can download the entire pdf report here.